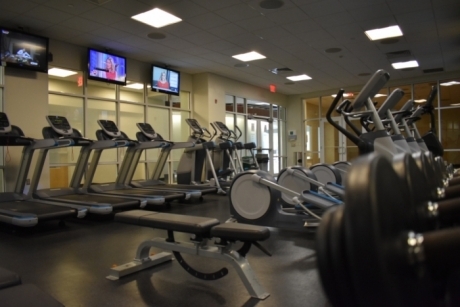 The Mount Vernon Fitness Center is a state-of-the-art fitness center located on the B1 level of West Hall on Mount Vernon Campus and is open to all members of the Mount Vernon Campus community, free of charge. Equipped with free weights, functional weight training equipment, a Smith machine, the facility has all of the resistance tools to help you reach your strength training goals. For your cardio needs, the Fitness Center has treadmills, adaptive motion trainers, ellipticals, spinning bikes, a recumbent bike, and a StairMaster. Seven flat-screened televisions line the walls for entertainment purposes. Access to the Mount Vernon Fitness Center is restricted to GWorld Card holders, and all patrons must tap their GWorld to enter.